Description: tripod vessel, ID number missing, location unknown. Iconographic Features: Eyeless Rayed Faces horizontally drawn. 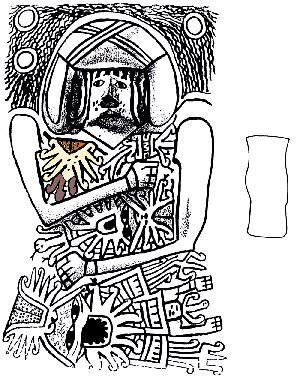 Description: vase portraying nobleman, drawing after Lavalle 1986, 143. 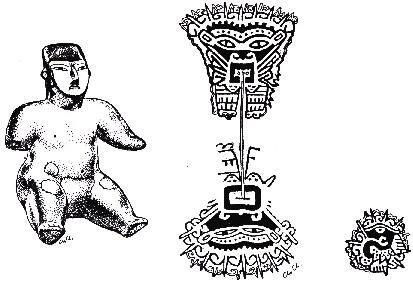 Iconographic Features: Eyeless Rayed Face, Bird Mythical Being 9 (BMB-9), Rayed Feline Face and Rayed Face with "Snake Eyes" as motifs on the tunic of a man. Description: bowl, ID number missing, M.N.A.A.H.-Lima. Iconographic Features: Rayed Feline Face and Rayed Face with Upturned Mouth Mask fighting each other. Gesture of tongue-touching indicates grasping and fighting. Description: cup bowl, C-31592, M.N.A.A.H.-Lima. Iconographic Features: Rayed Feline Face devouring a human of which only the part from the waist down to the feet is shown (left). On the right only the upper part of the human is shown whose torso reveals sets of ribs indicating starvation. 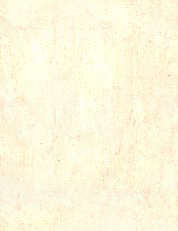 Description: vase, drawing after Lavalle 1986, 145, Museo Nacional, Lima. Description: vase with modeled head of guinea pig, C-34802, M.N.A.A.H.-Lima. 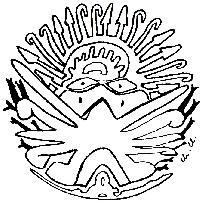 Iconographic Features: Rayed Feline Face and Bird Mythical Being 9 (BMB-9) drawn horizontally. Lower panel shows the spotted body of the guinea pig. Association with trophy heads. Description: plate, ID number missing, location unknown. Iconographic Features: Rayed Feline Face depicted with bloody mouth. Interpretation as celestial body. Iconographic Features: decapitated Mythical Monkey heads. Description: jar, ID number missing, M.N.A.A.H.-Lima. Iconographic Features: Surrounded Head (Proulx 2007, 112) consisting of a face framed by peppers. Iconographic Features: Killer Whale Head Rayed Faces devouring humans, probably warriors. Both supernatural creatures consist of a late Killer Whale head, human arms and human legs. They are surrounded by spears, loincloths, pepper and a rattle indicating a battlefield. Description: bottle, ID number missing, M.N.A.A.H.-Lima. Iconographic Features: decapitated Mythical Monkey heads/Killer Whale Mythical Being heads or Killer Whale Head Rayed Faces. Association with trophy heads and trazoidal trophy heads (Proulx 2007, 108). Description: figurine, 33-15-1, Museum für Völkerkunde, München. Chronological Era: Early Intermediate Period (EIP), Nasca 6/7 Phase. 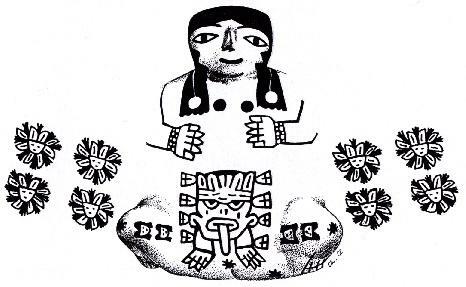 Iconographic Features: female figurine depicted naked and with body painting/tatoos. Surrounded Feline Head shown in the genital area. 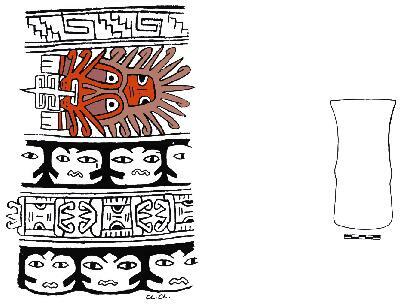 Surrounded Heads (Proulx 2007, 112) and trophy heads shown on waist and arms. Woman in the process of childbirth. Description: figurine, ID number missing, Linden-Museum, Stuttgart. Iconographic Features: female figurine depicted naked and with body painting/tatoos. Rayed Feline Face shown in the genital area. Killer Whale Head Rayed Faces shown on the knees. 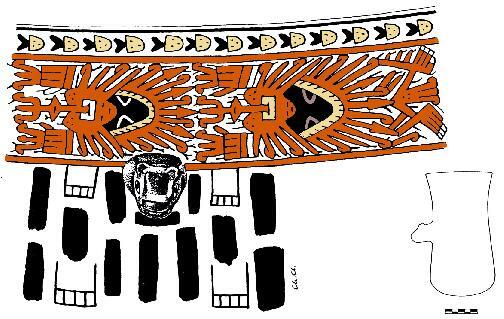 Description: effigy vessel, drawing after Lavalle 1986, 136. 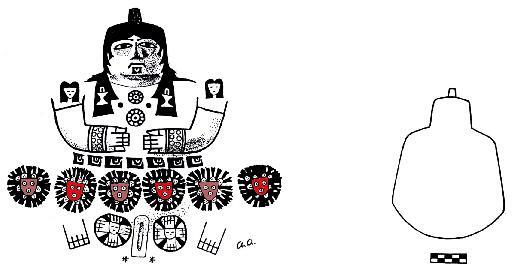 Iconographic Features: woman depicted with tunic that is decorated with Surrounded Heads (Proulx 2007, 112), Eye Mythical Beings and trophy heads. Woman in the process of childbirth.